We love to discover ways to extend the citrus season even though our variety of trees means we can start picking fruit (Satsumas) in late October followed by the navels reaching their peak around Christmas, and juice oranges like the Hamlins and Parson Browns, with of course the grapefruit, Meyer lemons and Key limes maturing throughout the winter months. Finally we wrap up our citrus season with the Valencias in May. Then slice the panels into slivers about a quarter inch wide. Fill a large sauce pan about two-thirds full of cold water. Add the peel and bring to a boil. Drain and repeat two more times for the grapefruit peels, using cold water each time. This will help to eliminate some of the bitterness of the grapefruit peels. For orange peel, just boil one time. Drain the peels well and put 3/4 cup sugar and 3/4 cup water for each grapefruit or two oranges in a saucepan. Stir and heat over medium-high heat until sugar dissolves. Add peels and bring to a slow boil. Boil gently for 15 to 20 minutes or until the peels become transparent. Remove peels from syrup with a slotted spoon and drain for a minute or two. Cover a cookie sheet with parchment paper and add a cup or two of sugar. 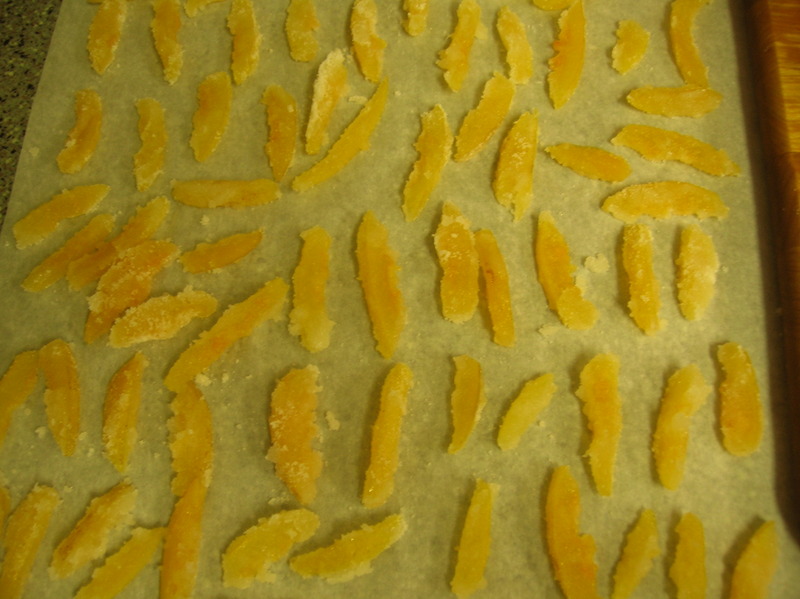 Adding a few at a time, roll the peels in the sugar and then set them aside to dry completely. When dry, they should be quite firm and can be stored in a tighly-covered container in a cool dry place. You might even want to save the syrup to use in creative ways — fruit or salad dressings, marinades — well you get the idea.